Give your room a natural, outdoorsy feel with this stunning wicker coffee table. Whether you are furnishing your living room, porch, or patio, the gorgeous, breezy look of this coffee table is sure to add exceptional coastal style. 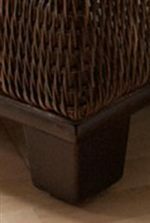 The look of this table was created by the use of tightly woven wicker and chic, modern accents like exposed wood tapered block feet, a smooth, beveled wood table top, and exposed wood trim in a dark, Kahlua color. The spacious and polished top of the coffee table makes an ideal place for serving snacks and beverages, storing remote controls and magazines, or displaying decorative objects. Extra storage can be found in the broad, open shelf underneath the table top. The Casablanca Tropical Wicker Cocktail Table with Wooden Top and Block Tapered Block Legs by Braxton Culler at AHFA in the area. Product availability may vary. Contact us for the most current availability on this product. The Casablanca collection from Braxton Culler is a sleek, polished take on tropical design, featuring pieces made of delicately woven wicker and minimalist design accents for a stunning way to outfit your home. Perfect for living room or patio, cabin or home, the Casablanca collection has a natural, breezy look and includes both upholstery and occasional pieces made in the coastal style. Wicker chair, sofa, ottoman, loveseat, end table, and coffee table are all trimmed with smooth, exposed wood and tapered wood block legs. 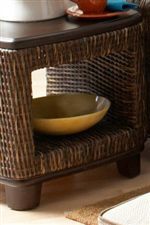 The tightly woven wicker and wood accents adorning this collection are finished in a rich Kahlua wood finish. Whatever the weather, it's always summertime with the Casablanca collection. The Casablanca collection is a great option if you are looking for Tropical furniture in the area. Browse other items in the Casablanca collection from AHFA in the area.